The BARITRAP 750 bariatric free standing trapeze is a floor mounted devices that allows patients to reposition themselves in bed. Prior to installation, verify that all package contents have been received in good condition. If components are damaged or missing, contact us immediately. DO NOT use substitute parts or assemble the while missing parts. Information that appears under the DANGER description concerns the protection of personnel from direct and pending hazards that, if not avoided, will result in immediate, serious personal injury or death in addition to damage of the equipment. Information that appears under the NOTE description gives added information, which helps in understanding the item being described. Clear a work space and remove all contents from shipping box. You can use the top of the box to place unwrapped items in. Place trapeze legs on the floor. Make sure foot pads are on the floor. Next, attach the mid-section on the posts coming up from the trapeze legs. Use the (12) ½” hex bolts and washers to attach the mid-section to the trapeze legs. Use the (4) 6” hex bolts, washers and lock nuts to attach the trapeze boom to the mid-section. Check to ensure that all bolts are tightened and secure. Not doing so may result in injury to the patient/resident or staff. Attach the trapeze handle to an appropriate spot for the resident. 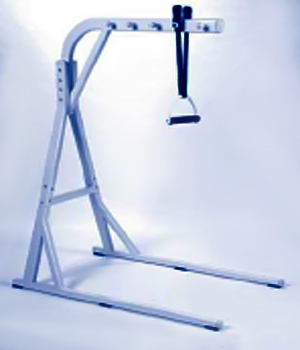 YOU HAVE NOW COMPLETED THE ASSEMBLY OF YOUR PRIMUS MEDICAL BARIATRIC FREE-STANDING TRAPEZE. Be sure to double-check all bolts and part placements on the trapeze. Also, be sure to remove all packaging materials from the area before allowing residents into the area. Prior to use, be sure to read and refer to the full Owner’s Manual for additional warnings. ALWAYS test this devise prior to each use. The trapeze frame should be cleaned periodically using a mild detergent and water. Be sure to completely dry the trapeze frame before use. When washing the trapeze straps, use only mild detergent and water. DO NOT USE BLEACH. Allow straps to completely air-dry before use. Do not place straps in dryer. On a quarterly basis, all hardware on the trapeze should be checked and tightened, the frame should be inspected to check for wear or damage, and the strap should be inspected for wear or damage.